Why Iraq remains a quagmire after decades of intervention, trillions of dollars, the full weight of American military power, and the deaths of hundreds of thousands of people. In one form or another, the United States has been at war with Iraq since 1990, including a sort-of invasion in 1991 and a full-scale one in 2003. During that quarter-century, Washington imposed several changes of government, spent trillions of dollars, and was involved in the deaths of hundreds of thousands of people. None of those efforts were a success by any conceivable definition of the term Washington has been capable of offering. With that in mind, here are five possible “strategies” for that country in which only one thing is guaranteed: none of them will work. In May, in the wake of the fall of the Sunni city of Ramadi to Islamic State (IS) fighters, President Obama announced a change of course in Iraq. After less than a year of not defeating, degrading, or destroying the Islamic State, the administration will now send in hundreds more military personnel to set up a new training base at Taqaddum in Anbar Province. There are already five training sites running in Iraq, staffed by most of the 3,100 military personnel the Obama administration has sent in. Yet, after nine months of work, not a single trained Iraqi trooper has managed to make it into a combat situation in a country embroiled in armed chaos. Leaving aside the all-too-obvious joke—that Dempsey is proposing the creation of a literal swamp, a desert quagmire of the lily-pad sort— this idea has been tried. It failed over the eight years of the occupation of Iraq, when the United States maintained an archipelago of 505 bases in the country. (It also failed in Afghanistan.) At the peak of Iraq War 2.0, 166,000 troops staffed those American bases, conducting some $25 billion worth of training and arming of Iraqis, the non-results of which are on display daily. The question then is: How could more American trainers accomplish in a shorter period of time what so many failed to do over so many years? There is also the American belief that if you offer it, they will come. The results of American training so far, as Secretary of Defense Ashton Carter made clear recently, have fallen far short of expectations. By now, US trainers were to have whipped 24,000 Iraqi soldiers into shape. The actual number to date is claimed to be some 9,000 and the description of a recent “graduation” ceremony for some of them couldn’t have been more dispiriting. (“The volunteers seemed to range in age from late teens to close to 60. They wore a mish-mash of uniforms and boots, while their marching during the ceremony was, shall we say, casual.”) Given how much training the United States has made available in Iraq since 2003, it’s hard to imagine that too many young men have not given the option some thought. Simply because Washington opens more training camps, there is no reason to assume that Iraqis will show up. And here’s some bonus information: for each US soldier in Iraq, there are already two American contractors. Currently some 6,300 of them are in the country. Any additional trainers mean yet more contractors, ensuring that the US “footprint” made by this no-boots-on-the-ground strategy will only grow and General Dempsey’s lily-pad quagmire will come closer to realization. Among the boots-on-the-ground crowd are also some former soldiers who fought in Iraq in the Bush years, lost friends, and suffered themselves. Blinking through the disillusion of it all, they prefer to believe that we actually won in Iraq (or should have, or would have, if only the Bush and Obama administrations hadn’t squandered the “victory”). Needed now, they claim, are more US troops back on the ground to win the latest version of their war. Some are even volunteering as private citizens to continue the fight. Can there be a sadder argument than the “it can’t all have been a waste” one? As hesitancy within the US military to deploy ground forces in Iraq runs into chicken-hawk drum-pounding in the political arena, working ever more closely with Iran has become the default escalation move. If not American boots, that is, what about Iranian boots? The original Obama administration plan was to use Arab, not Iranian, forces as proxy infantry. However, the much-ballyhooed 60-nation pan-Arab coalition proved little more than a short-lived photo op. Few, if any, of their planes are in the air anymore. America flies roughly 85 percent of all missions against Islamic State targets, with Western allies filling in a good part of the rest. No Arab ground troops ever showed up and key coalition countries are now openly snubbing Washington over its possible nuclear deal with Iran. Washington has, of course, been in a Cold War–ish relationship with Iran since 1979 when the Shah fell and radical students took over the American Embassy in Tehran. In the 1980s, the United States aided Saddam Hussein in his war against Iran, while in the years after the invasion of 2003 Iran effectively supported Iraqi Shiite militias against American forces occupying the country. Iranian Quds Force commander Qassem Soleimani, currently directing his country’s efforts in Iraq, was once one of the most wanted men on America’s kill list. In the wake of the 2014 Islamic State capture of Mosul and other northern Iraqi cities, Iran ramped up its role, sending in trainers, advisers, arms, and its own forces to support the Shiite militias that Baghdad saw as its only hope. The United States initially turned a blind eye on all this, even as Iranian-led militias, and possibly the Iranians themselves, became consumers of close American air support. In Washington right now, there is a growing, if quiet, acknowledgment that Iranian help is one of the few things that might push IS back without the need for US ground troops. Small but telling escalations are occurring regularly. In the battle to retake the northern Sunni city of Tikrit, for example, the United States flew air missions supporting Shiite militias; the fig leaf of an explanation: that they operated under Iraqi government, not Iranian, control. “We’re going to provide air cover to all forces that are under the command and control of the government of Iraq,” a US Central Command spokesperson similarly noted in reference to the coming fight to retake the city of Ramadi. That signals a significant shift, former State Department official Ramzy Mardini points out: “The US has effectively changed its position, coming to the realization that Shiite militias are a necessary evil in the fight against IS.” Such thinking may extend to Iranian ground troops now evidently fighting outside the strategic Beiji oil refinery. Things may be even cozier between the United States and the Iranian-backed Shiite militias than we previously thought. Bloomberg reports that US soldiers and Shiite militia groups are both already using the Taqaddum military base, the very place where President Obama is sending the latest 450 US military personnel. The downside? Help to Iran only sets up the next struggle the United States is likely to bumble into because of a growing Iranian hegemony in the region. Syria, perhaps? There is some slight truth in all this. The Kurds have indeed done a good job of pushing IS militants out of swaths of northern Iraq and were happy for US assistance in getting their Peshmerga fighters to the Turkish border when the locus of fighting was the city of Kobane. They remain thankful for the continuing air support the United States is providing their front-line troops and for the limited weapons Washington has already sent. For Washington, the problem is that Kurdish interests are distinctly limited when it comes to fighting Islamic State forces. When the de facto borders of Kurdistan were directly threatened, they fought like caffeinated badgers. When the chance to seize the disputed town of Erbil came up—the government in Baghdad was eager to keep it within its sphere of control—the Kurds beat the breath out of IS. Many Sunnis see no other choice but to support the Islamic State, as they did Al Qaeda in Iraq in the years after the American invasion of 2003. They fear those Shiite militias—and with good reason. Stories from the largely Sunni city of Tikrit, where militia-led forces defeated Islamic State fighters, describe “a ghost town ruled by gunmen.” In the Euphrates Valley town of Jurf al-Sakhar, there were reports of ethnic cleansing. Similarly, the mainly Sunni population of the city of Nukhayb, which sits at a strategic crossroad between Sunni and Shiite areas, has accused the militias of taking over while pretending to fight the extremists. There remains great fear in Sunni-dominated Anbar of massacres and “cleansing” if Shiite militias enter the province in force. In such a situation, there will always be a place for an Al Qaeda, an Islamic State, or some similar movement, no matter how brutal, to defend the beleaguered Sunni population. What everyone in Iraq understands, and apparently almost everyone in America does not, is that the Islamic State is a symptom of civil war, not a standalone threat. Yet despite the risk of escalating Iraq’s shadow civil war, the US now is moving to directly arm the Sunnis. Current plans are to import weapons into the newest lilypad base in Anbar and pass them on to local Sunni tribes, whether Baghdad likes that or not (and yes, the break with Baghdad is worth noting). The weapons themselves are as likely to be wielded against Shiite militias as against the Islamic State, assuming they aren’t just handed over to IS fighters. The loss of equipment to those militants is no small thing. No one is talking about sending more new weaponry to Iraq, no matter who the recipient is, should ignore the ease with which Islamic State militants have taken US-supplied heavy weapons. Washington has been forced to direct air strikes against such captured equipment—even as it ships yet more in. 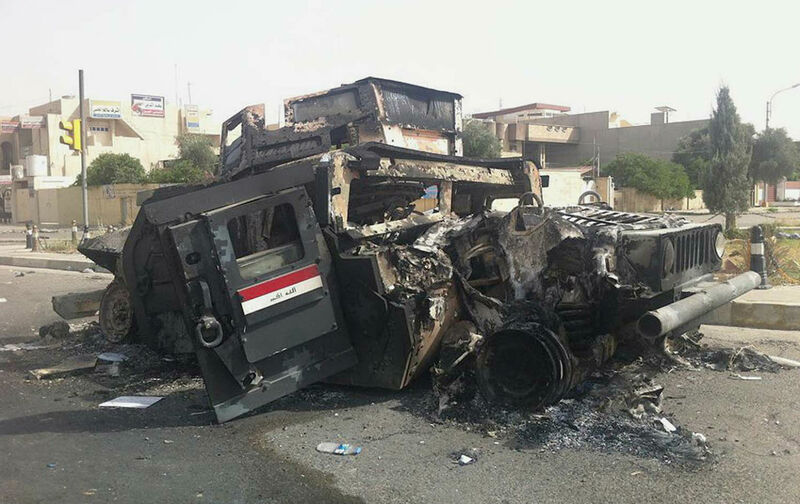 In Mosul, some 2,300 Humvees were abandoned to IS fighters in June 2014; more were left to them when Iraqi army forces suddenly fled Ramadi in May. This pattern of supply, capture, and resupply would be comically absurd, had it not turned tragic when some of those Humvees were used by IS as rolling, armored suicide bombs and Washington had to rush AT-4 anti-tank missiles to the Iraqi army to destroy them. The fundamental problem underlying nearly every facet of US policy toward Iraq is that “success,” as defined in Washington, requires all the players to act against their own wills, motivations, and goals in order to achieve US aims. The Sunnis need a protector as they struggle for a political place, if not basic survival, in some new type of Iraq. The Shiite government in Baghdad seeks to conquer and control the Sunni regions. Iran wants to secure Iraq as a client state and use it for easier access to Syria. The Kurds want an independent homeland. When Secretary of Defense Ash Carter remarked, “What apparently happened [in Ramadi] was that the Iraqi forces just showed no will to fight,” what he really meant was that the many flavors of forces in Iraq showed no will to fight for America’s goals. In the Washington mindset, Iraq is charged with ultimate responsibility for resolving problems that were either created by or exacerbated by the United States in the first place, even as America once again assumes an ever-greater role in that country’s increasingly grim fate. For America’s “plan” to work, Sunni tribesmen would have to fight Sunnis from the Islamic State in support of a Shiite government that suppressed their peaceful Arab Spring–style protests, and that, backed by Iran, has been ostracizing, harassing, and murdering them. The Kurds would have to fight for an Iraqi nation-state from which they wish to be independent. It can’t work. Go back to 2011 and it’s unlikely anyone could have imagined that the same guy who defeated Hillary Clinton and gained the White House based on his opposition to the last Iraq War would send the United States tumbling back into that chaotic country. If ever there was an avoidable American crisis, Iraq War 3.0 is it. If ever there was a war, whatever its chosen strategies, in which the United States has no hopes of achieving its goals, this is it.